As if we needed more reasons to go organic, an interview posted at Dr. Mercola's website reveals the alarming extent to which fluoride has contaminated a large portion of the everyday foods you buy in the grocery store. According to the interview, many non-organic foods are laced with dangerous levels of fluoride --- in some cases up to 180 times the amount legally allowed in city water. The culprit is a pesticide which many non-organic "farmers" are using, made from cryolite (sodium hexafluoroaluminate). The pesticide is "sticky" and therefore remains on the plants for a lengthy period of time, which is one reason it is so effective at killing insects. The fluoride-poison is being used on everything from tomatoes to oranges to grains to apples to... you name it. As you might imagine, the produce which seems to be the most heavily contaminated is lettuce, perhaps due to its very high water content. But the problem extends beyond fresh produce --- it also affects orange juice, frozen produce, breakfast cereal, and more. The tiny fluoride molecules are difficult to remove from the produce on which they are sprayed, because they actually pass into the produce. According to the source, when all the sources accumulate, consumers are subject to up to 700 times the maximum "safe" limit of fluoride. Although it isn't mentioned the extent to which conventional non-organic meat is affected by fluoride, presumably it is contaminated too --- since the non-organic livestock (be they cattle or poultry or pigs) would be ingesting grains which have been sprayed with fluoride pesticides as well. For those of us who've already shifted our buying to organic, all this fluoride contamination probably comes as no surprise. Added to the already horrendous amount of synthetic fertilizers and poisons which go into conventional "food" production, what's one more toxin? And that reminds me of another thing. How much of the organic food in the grocery store is being irrigated or washed with chlorinated or fluoridated city water? It may surprise you to know that organic food producers are allowed to use city water sources to irrigate or wash their produce and water their livestock, if that's all there is available. Therefore it's not enough for you to simply buy organic, even though that is an excellent start. Rather, get to know your farmer(s) and find out if the water they use is chlorinated or fluoridated. Even if they are not on city water, you may find that they are chlorinating their well water in order to sanitize it. None of the water on our farm is chlorinated or fluoridated, by the way. Our livestock drink from naturally occurring water sources up here on Sumas Mountain. 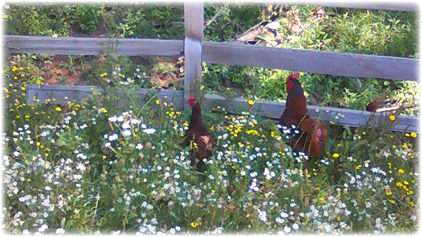 Here are two of our chickens out on the pasture. So what can you do to make sure your food is as pristine as possible? Visit farmer's markets, and go to local, organic family-run farms and buy from the farmers directly. And while you're at it, get to know the farmer and ask them questions --- learn how your food is produced. This past week, we were at the Kelowna farmer's market to buy produce from some of our preferred (certified) organic sources. One of the vendors was selling bread made with certified organic grains which they grew themselves, local to the Okanagan. If you're willing to make the trip up to Kelowna, then between the Fraser Valley and the Okanagan you can find nearly all the major food products you need, all produced relatively locally and certified organic. Bread, fruit, vegetables, dairy, eggs and meat. Yes, you'll need a medium sized freezer to store the food, and may have to can some of it (it's worth it). But each food dollar that you spend with local organic family farms is one less food dollar flowing into the chemical-dependent industrial "farms". The good news is that the tide is starting to turn, as more consumers become aware of what's going on with their food.